Thanks for joining me for the second installment of “The Good Aunt” series. Today, I’d like to share some stories with you from the women I interviewed and from my own life about the role models our own aunts were for us. There are as many different ways an aunt can influence as there are different types of aunts: free spirits and disciplinarians, great cooks and those who loved takeout, teachers, nurses, career women, homemakers, aunts who had children of their own and aunts who were childless, aunts who lived with us and aunts who lived many hours away. Two of the women I interviewed spoke of aunts whose presents they always especially looked forward to unwrapping, because they knew it would be something special: a prized treasure from an exotic location or another piece of a special collection dear to that child’s heart. Some of our aunts took us on vacations with them, and now we pass that experience on to our own nieces and nephews by inviting them to join us on our travels or having them visit us at home during their breaks from school. They fed us if they thought we weren’t growing fast enough. They scolded us and taught us right from wrong when our parents weren’t nearby to do the job. They taught us how to be proper young ladies. They adored us and spoiled us. They took us out of our parents’ hair for a few precious hours to let our parents rest or get work done. One of the women I interviewed spoke of her aunt who took on the role of family matriarch, gathering the extended family together for holidays and nurturing the children as they grew. Her greatest gift to her niece, though, was living out her Christian faith by example, and encouraging her niece to find a church home that would nurture her own faith. Her words are etched in my friend’s memory: “You can’t be a Christian by yourself.” She credits her aunt in part with getting her back inside the church doors after many years away. The common thread through all of these accounts, though, is the gift of time and attention. Our aunts send us cards or gifts in the mail. They call us to find out how we’re doing. They show an interest in our lives and our hopes and dreams. And there’s so much they can model about living a rich life. I had three great aunts growing up who were all forces of nature. I adored each one of them but for very different reasons. They were my mother’s aunts, but they were like three grandmothers to me (I never got to know either of my grandmothers). Aunt Grace wouldn’t take any guff from anyone. She was stubborn but loyal, and she loved an audience so she could sit and tell stories. She was a tomboy who never married (though she had a dear friend whose proposal she later regretted turning down), a private-duty nurse and an army volunteer during World War II. She loved, possibly more than anything else, to fish, and she adored anyone who would share fish stories with her. She made sure my mom and uncle and aunt went to the dentist when they were kids. And she made sure they knew how to swim well. She also smoked like a chimney, and the years I spent sitting across from her at the table, watching her smoke and play solitaire, are years I credit with the reason I have never had any desire to try a cigarette. I was mad at her for smoking, especially when she died of a stroke when I was in middle school. I would have given anything to have the extra days with her that not smoking might have provided. 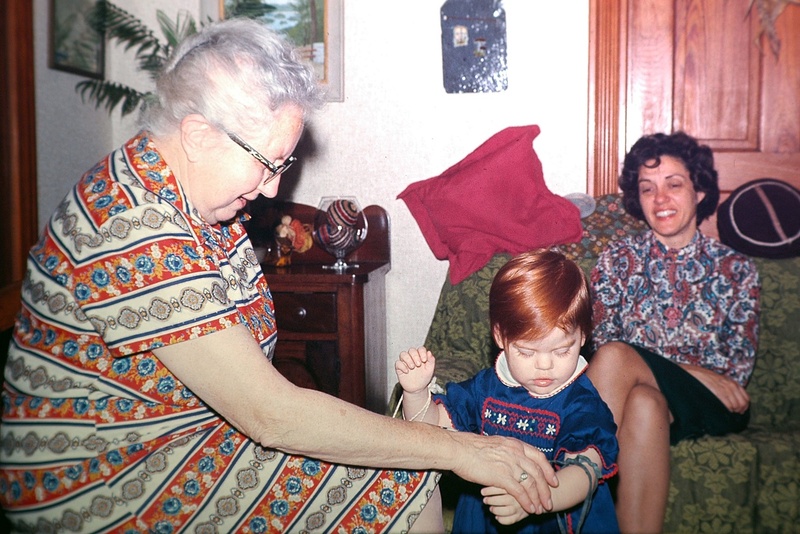 She wasn’t perfect, and she taught me something about the harm of playing clear favorites within a family, but she loved us, and I adored her. Aunt Clare rivaled Aunt Grace in her love of storytelling, usually with embellishments that could lead to a debate between the two of them about how well one was remembering the facts of the story. She did the bulk of the cooking when we visited, and there was nothing like her Christmas plum pudding with hard sauce. She had owned a tea room in New York on the site that is now the Rockefeller Center, and had teacups all over her living room from that time in her life. She never married, after losing her fiancé to the great flu epidemic that swept the country after WWI. My mom says Aunt Clare couldn’t go to weddings for many years for fear that she would cry during the ceremony. She would have been a wonderful wife and mother, but I was blessed to have more of her attention because she was such a wonderful aunt. She died within days of Aunt Grace, and their double funeral made my middle-school-girl heart heavy. Aunt Reba, like Aunt Grace, was a private-duty nurse, and she was the first family member to demonstrate to me what it truly meant to love “in sickness and in health.” She married (for the first and only time) at age 59 – a loving marriage to a man who had served in WWI with my grandfather. But my great uncle was stricken with Parkinson’s Disease, and Reba nursed him through the last difficult years of his life. I never heard her complain. She lived to be 100, and so was the only one of my great aunts who was still living once I made it to adulthood. She was an amazing cook, too, and like her sisters, was an integral part of the small church they all attended. Plus, she always had a box of chocolates to share. To try to sum up my aunts’ lives and their impact on their family in a few short paragraphs is simply not possible. But through their examples, they taught all of us the appreciation for hard work, for cultivating interests well, and for loving our family. I got married later than most of my friends, and it was my three great aunts’ lives that showed me the way to a life that looked different than convention dictated but was a life that was nonetheless wonderful and fulfilling. Aunt Reba’s marriage at 59 always gave me hope that it would never be too late to find my lifelong love. And the love all three of them showed my extended family and their ability to build a community of friends through church was a model that deeply influenced me. How have aunts influenced your life? For good or bad, did they set an example or make sacrifices for you or simply spend time getting to know you and making you feel important? I’d love to hear about your own good aunts. So please feel free to share your story in the comments below. See you here next Monday for the next post in this series. This entry was posted in good aunt and tagged aunt, family tree, good aunt by hopesquires. Bookmark the permalink.